Long time readers of this blog will know that each year as soon as the list of Campbell Award nominees are announced I make it my mission to promote the award by inviting them to share the tales of their most memorable meals. Alas, I don’t always succeed and some of the nominees don’t get showcased. Sometimes, it’s because a writer has previously appeared here, in which case they only get mentioned in passing with a link to that earlier entry. 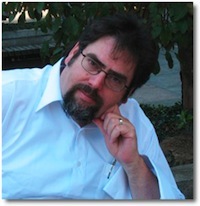 Sometimes an author just can’t be contacted or doesn’y respond. And sometimes, because this the way life is for writers, they’re just too busy with higher priorities to get back to me. 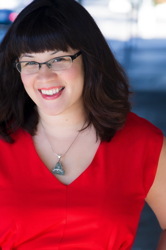 Earlier in the year, this week’s EATING AUTHORS guest year, Sarah Kuhn, was a finalist for the Campbell Award and other obligations kept her from a timely appearance on this blog. But she’s here now and I am pleased as the proverbial punch to have her. She writes non-fiction, she writes short stories, she writes comics and graphic novels. 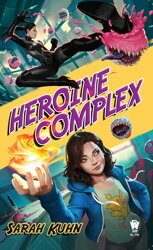 Oh, and she’s also done this pretty amazing series of books, the Heroine Complex (the third came out this past July). If you’ve not encountered them before, just run with the elevator pitch of “The Devil Wears Prada with superheroes” and you’re good to go. 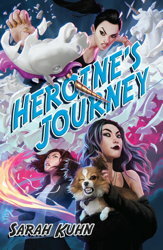 Because if you like hot romance, supernatural karaoke battles, and evil cupcakes, Sarah has you covered. And just in case that’s not enough, look for her YA debut next June, I Love You So Mochi, a romantic comedy set in Japan. LMS: Welcome, Sarah. What’s your most memorable meal? SK: There’s nothing better than coming in from the rain to stuff your face with a hot, decadent meal. Even better if you’ve just emerged from a long, treacherous road trip. Even better if said road trip culminated in a slippery drive over the San Francisco Bay Bridge and the miracle of a parking spot on one of those narrow, hilly streets that are one hundred percent not built for parking spots. Of course the drive turned trafficky, of course it started raining, of course we were caught in a full-on storm by the time we edged our way into Oakland and onto the bridge. The rain pounded so forcefully against our car windows, I was sure it was going to bust right through and drown us and then we’d never get to eat and even if we didn’t drown, we’d probably combust from hangry-ness. It must have been almost 10 pm at that point. The wonderful Aunties who own the place plopped giant, steaming plates of meat and rice and crackly fried imperial rolls in front of us. We did not waste any time talking during that meal. We inhaled. But it wasn’t the kind of inhaling where you don’t register what you’re eating. We love every single goddamn bite. The real star for me was the meat sauce, which is just what it sounds like—bits of meat in a gloriously savory, gravy-like sauce dumped over a pile of rice. I scraped my plate clean and when Auntie asked if I wanted more meat sauce, I almost cried. The rain was still pouring down, gushing like it was being dumped out of gigantic sky buckets, but we were safe and warm and full. Whenever I go back to San Francisco, I hike up one of the massive hills to go to Cordon Bleu. I get there right when they open because otherwise it gets packed, everyone jostling for one of the few seats at the tiny counter. I order the same thing I ordered that night, meat on rice and imperial roll fresh from the fryer. I eat until I’m full to the point of bursting, savoring every bit of it. And when Auntie asks if I want more meat sauce, I always say yes. Thanks, Sarah. It’s oft been said that hunger is the best sauce. That may be, but a cold rain surely comes in as a close second. Never want to miss an installment of EATING AUTHORS? This entry was posted on Monday, October 8th, 2018 at 7:30 am	and is filed under Plugs. You can follow any comments to this entry through the RSS 2.0 feed. You can leave a response, or trackback from your own site.